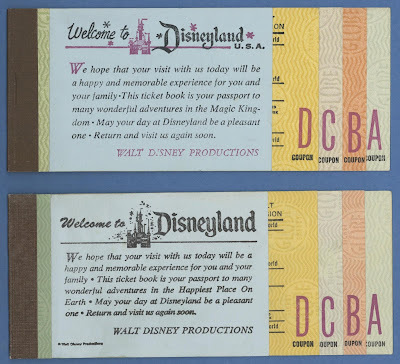 Let’s take a look at some minor yet noticeable changes that occurred with the Disneyland Ticket Books back in the early 1970’s. 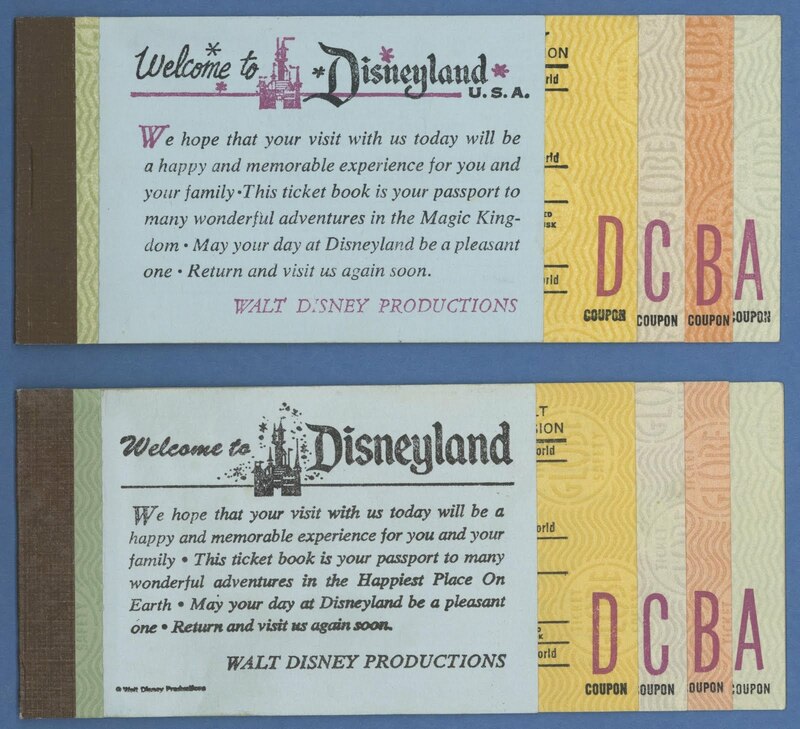 The Ticket Book on the top is from May 1971 and as you can see the welcome message is printed in two colors, mostly black and then some cool "Disneyland purple", with the “W” being my favorite. The lower Ticket Book from March 1973 is lacking its two-tone welcome message, I think Kevin Yee calls the “declining by degrees”. 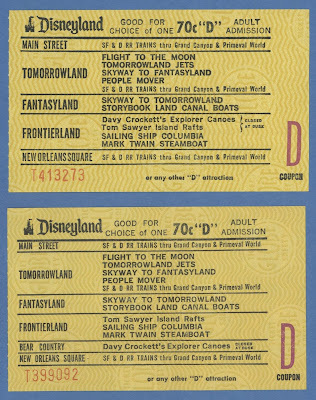 The back of Ticket books were really changed around. 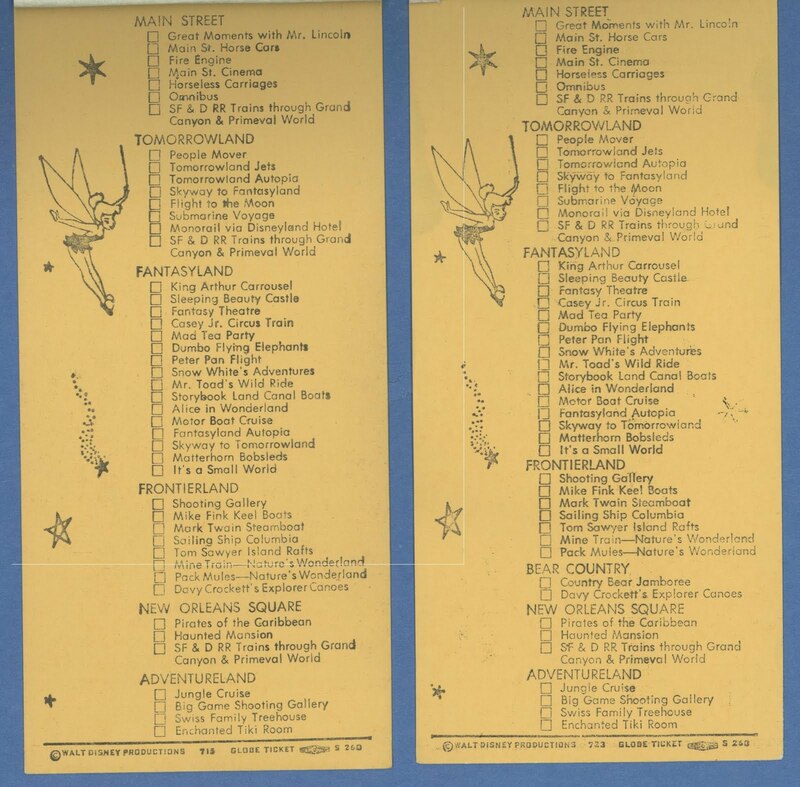 May 1971 (top) still has the purple castle and the “D” in Disneyland is nicely stenciled. Also Walt’s stylized signature (with an apostrophe 's added) appears on the back of the 1971 book, even though it was removed from the welcome message in 1967 and replaced with “Walt Disney Productions" as show above. March 1972 (below) saw the final removal of Walt’s signature, the "Disneyland purple" has been replaced with red, the stencil on the “D” is gone and the Disneyland font seems to have been tightened up or something. At least the price was the same! 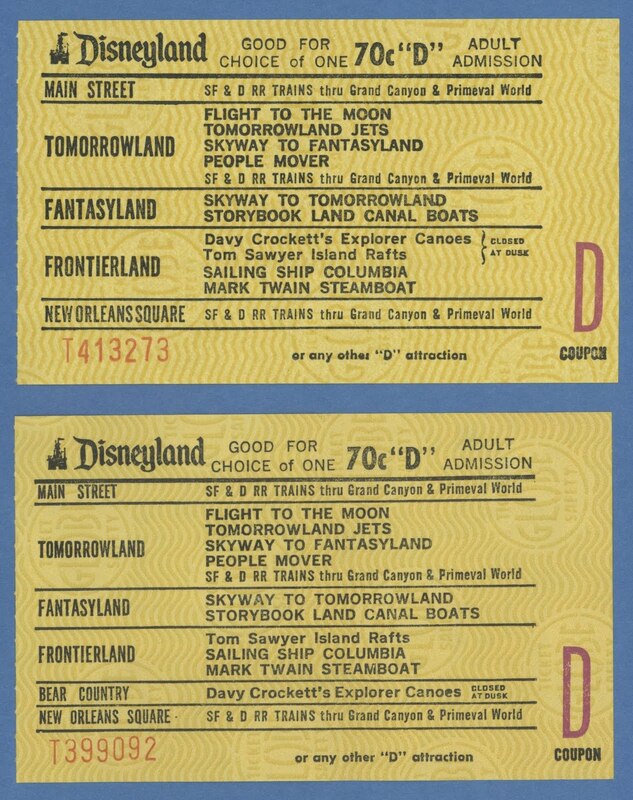 The only printed change on these two “D” tickets is the addition of Bear Country on the March 1972 ticket (below) and all that did was move the Canoes from Frontierland to Bear Country. The bigger change can be seen in the Globe safety paper. Notice on the 1971 ticket the watermark lines are sort of a zig-zag of straight lines (like the one in the header of this blog). On the 1972 ticket the lines are now rounded or wavy - groovy baby. 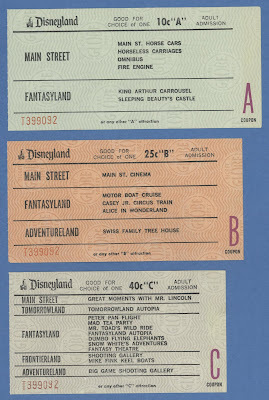 The “A” ticket appears to have been printed on the older style of paper. 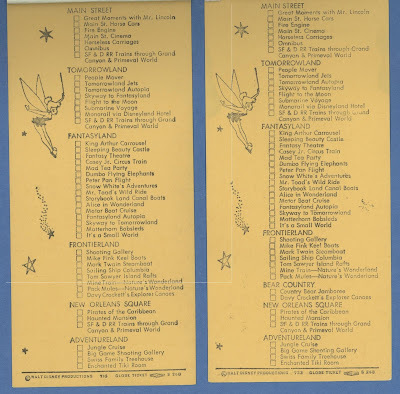 There were no “E” tickets left in this book (naturally) and I’m too lazy to dig up one from the correct year, but you can see one from 1973 here (link). From what I can tell the attraction list has one new land and one new attraction. I love all the little details that you manage to glean from the ticket books. I'm way too lazy to go through mine to compare them! 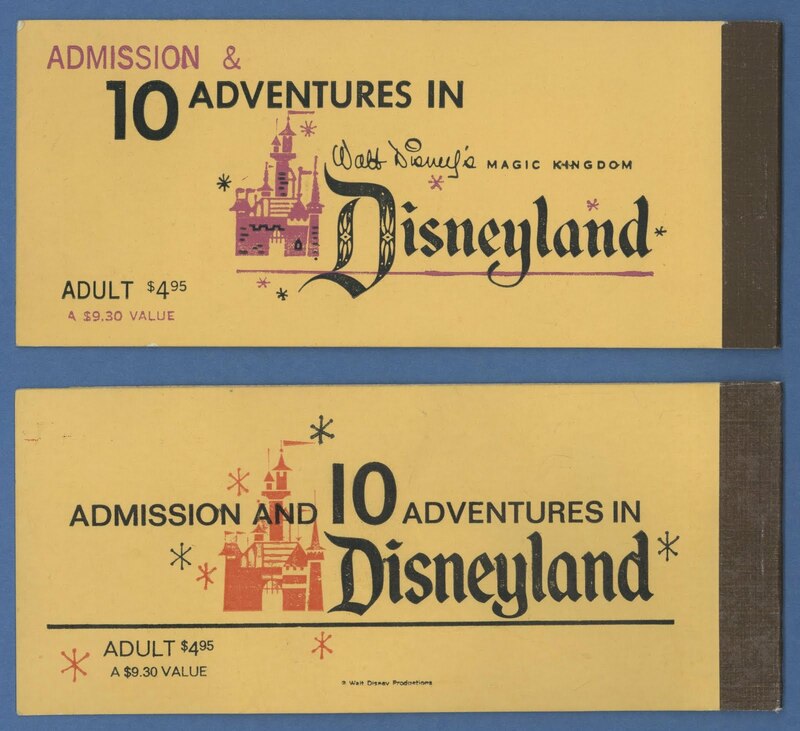 Do you think that the redesign had something to do with the fact that they were printing ticket books for WDW, and maybe wanted to update Disneyland's book design as well? The opening of WDW might also explain the removal of the term "Magic Kingdom" from the front and back text. 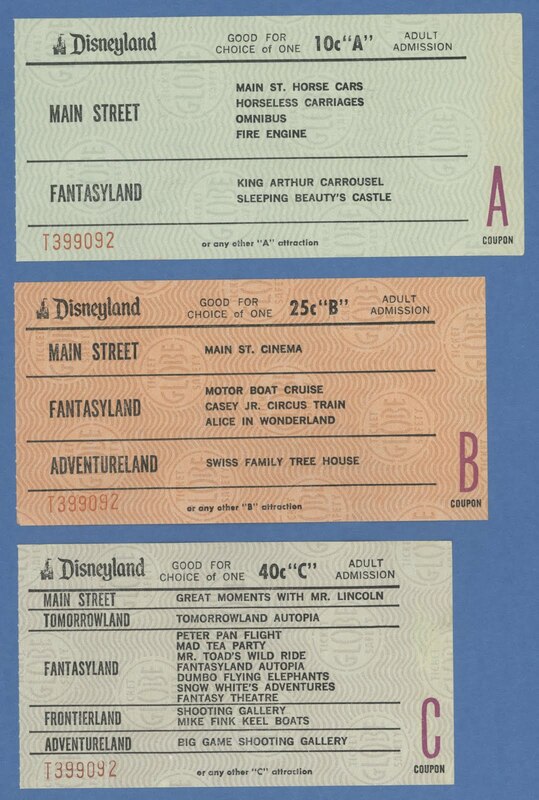 It would be interesting to directly compare with WDW ticket books from those same years. ...the Disneyland font seems to have been tightened up or something. More accurately, they swapped out the original Disneyland logo for the modern-day version, which had begun to appear some years prior and was already printed on the 1971 tickets.